Happy Tuesday! Well, today is the BIG day with Wallis...breakfast, shopping, press day and getting to tour their offices. Is this REALLY happening? Yes, yes it is. I will probably be Instgramming out the wazoo all day, so be sure to follow me @shannasaidso if your the least bit curious. Miss Annie is here for your viewing pleasure today. Her and I have been buds since I started my blog. I know without a doubt that we would be hanging out on the daily if we lived closer. Love is not a strong enough word for the feelings I have for Annie. She not only has killer style, but she is hilarious, down to Earth and as real as they come. We are both following our dreams of personal styling. If only we could find a way to live in the same city and become business partners. This girl is a Madewell & J.Crew Queen. Every time I step foot in these stores I think of her, and she does the same with me at Forever 21. We are tight like that. Give her some love. It won't be too hard after you see how she nailed this look. Hey guys! I'm Annie and I blog over at The Other Side of Gray. I am SO SO happy to be guest posting for my girl Shanna while she is over in LONDON doing fabulous things for Wallis Fashion! Because of all the amazing things going on for her right now...Shanna asked me to talk a little bit about following my own dreams. Which is pretty relevant because Shanna is actually someone who sort of nudged me in the direction to take my dream to the next level. So - what is this dream I speak of? Personal styling! Actually, I would be thrilled with any sort of career in the fashion industry, but I think personal styling would just be such an awesome and rewarding thing to do every day. A cute outfit can go a long way and I truly believe looking good makes you FEEL good. You guys probably know this, but Shanna has a little personal styling business of her own goin' on, and when I saw her start to take her next steps, I reached out and we exchanged a few emails. The girl is awesome let me tell ya. It's terrifying to take any dream to the next level because putting yourself out there can lead to failure, etc., but with Shanna's encouragement and some from my friends and family, I posted a "Styling Services" tab on my blog a few months ago! I wish I could tell you I've had success...but not so much. I haven't really advertised it very well, so it's my own fault...but that will be my next goal for moving it forward. In the meantime, I have some friends I've been practicing on to get more experience, and I hope one day soon I will have my first REAL client. And I'm proud of myself for even taking that little step and posting the services because, as we can see from Shanna and her new Wallis fashion gig, you never know what can happen when you follow your dreams :) Cheesy but true. And what goes with following your dreams? A fabulous outfit of course! So this is me, saying bring it on dreams...bring it on! Anyone else now have Mariah Carey in their head? "Dreamlover come rescue me..." Anyone? I already told you on your blog, Annie...but this dress is fantastic!!! And yes, advertise your styling business some more, because you will do such a great job at that! Love today's look! And you are right, Shanna has a special way of inspiring people. She is just so upbeat and not afraid of anything...which is amazing! I know Annie's blog and she got an adorable and perfect style! Love the dress and how she styled it! :) I have the same fashion dream! :) Kisses! Beautiful look! This may seem odd, but try posting ads on craigslist! I was a personal shopper at my local mall and met others who just advertised on CL to style girls for their prom, etc. and it turned out great! Starting small with friends, neighbors, their friends and the like. If you also offer closet organization and could find someone to help you do hair and make up you could have a little entourage/ glam squad going on! Annie, you would be a great stylist! Good luck with everything! Your dreams can become reality! First of all, this is an AWESOME look Annie!! Secondly, good for you for going after what you want to do. After my first son was born, I sort of had this awakening. I knew that I wanted to do something in fashion and personal styling was what came to mind. I had a super-ghetto website for 3 years and didn't really do anything with it. I definitely want to get into it now. I'm so glad you choose Annie to guest post today! I love her blog and now I found yours as well, I love your style. Can't wait to see more! 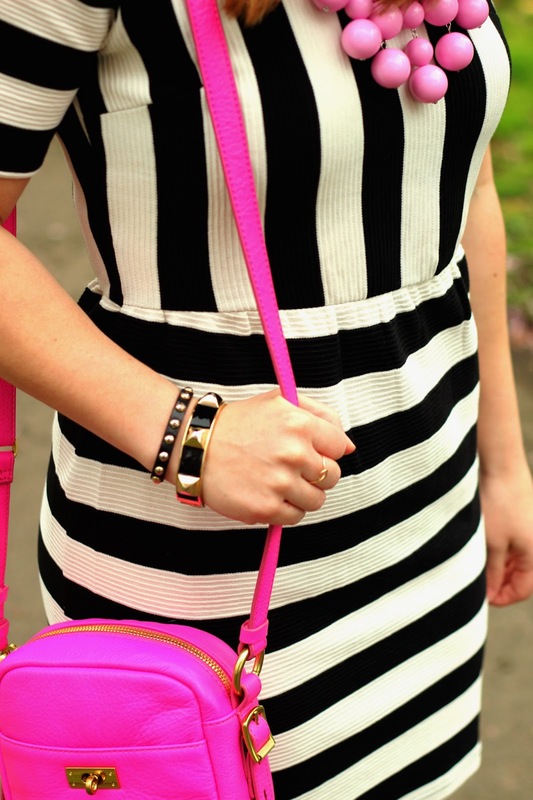 I adore Annie, and her blog––she has such fabulous style, and this may be one of my favorite looks yet! Oh my goodness Annie would be the best at personal styling! Her outfits never cease to amaze me-- always so fun and different! she looks amazing as always and have an awesome time! 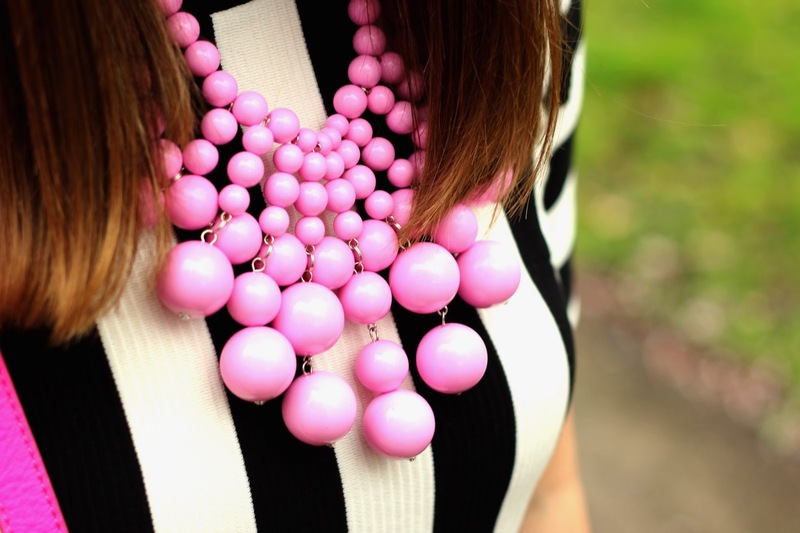 LOVE the pop of pink on the black & white, very pretty! Shanna! This is so fun to get to know your blog loving buddies here, too. Hope you are having a BLAST!!! Love Annie's blog. She was such a HUGE help when I started my blog, such a sweet lady with greta style! This dress and the pink accessories are so cute!!! Your outfit is amazing love!! I am so happy you decided to follow your dream!! Can't wait to see more pics soon! 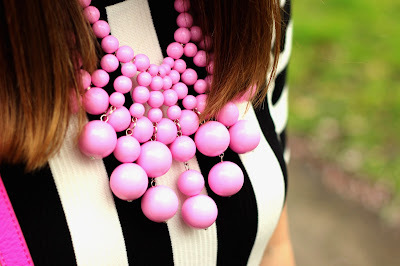 I am in love with the necklace...and great dress!